Rubber Hugs by Kristen: I am back! Hello everyone! Sorry I have not posted in a while again. We had a few family functions that got in the way--LOL! 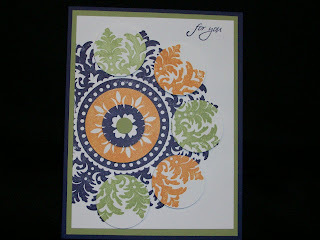 Today's post is a replica of my friend CherylAnn's card. I saw her card and just new I had to do one too. I made a minor adjustment and created this card. I hope you like it as much as I do! Stop on over to her blog and leave some love as well. If you don't know what "leave some love is", it is where you comment on the cards you see. We do LOVE hearing what you think! Thanks for stopping by! Very pretty. i love your version. And thanks for the mention. I will repay the favor.